Does the thought of eating steak for breakfast, lunch, and dinner make your mouth water? Or does it make your stomach turn? 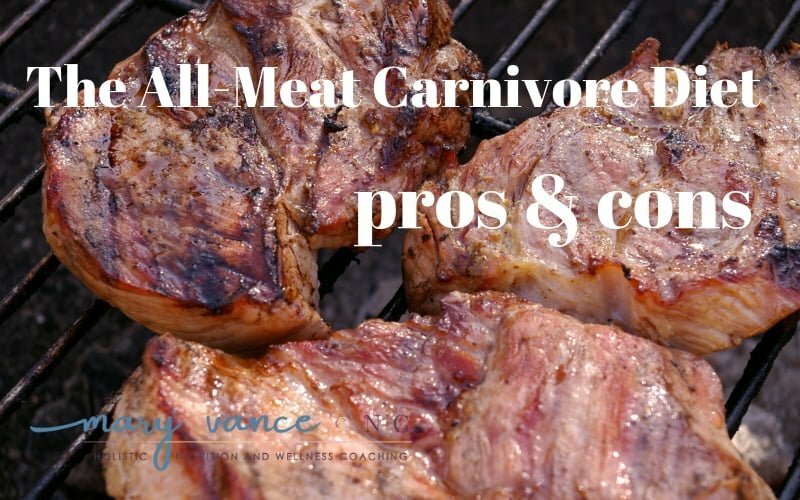 Many of my colleagues and folks in the paleo keto community are trying and touting the all-meat, zero carb carnivore diet, so of course I was compelled to dive into any research to examine the benefits and risks involved. While I strive to present an unbiased look at diet fads by letting you know the pros and cons, I of course have my own opinions that I will share. What we eat has an incredible impact on our health. For example, your diet has the ability to prevent or contribute to disease and inflammation. And certain diets, like the ketogenic diet, even have physiological effects as powerful as prescription meds. 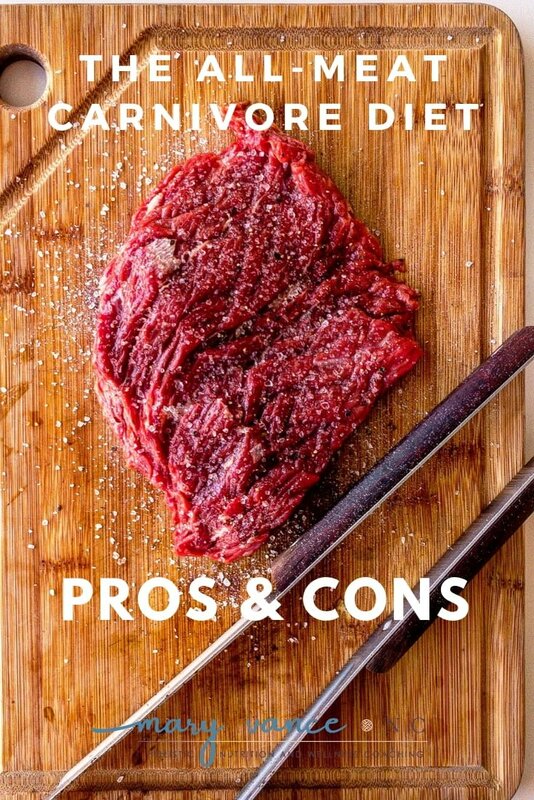 (Side note: Please check out my post on the pros and cons of keto if you want a closer look at benefits and risks, and don’t forget to check out the comment section to see just how passionate people are about this diet, facts or not). The rules are simple for the carnivore diet: Eat only meat, organ meats, seafood, bone broth, and eggs (optional). No plants. Nothing else. Just meat. Some people drink coffee, use butter and cream, or include cheese. Others are purists, even limiting spices and using only animal fats. Vegetables, grains, nuts, seeds, fruit, alcohol, or anything else not meat related is off limits. Optional Supplements: sea salt, minerals, antioxidants, perhaps a multi to cover the bases for all the nutrients you cannot obtain from meat; however, some discourage supplement use. This diet was popularized by Mikhaila Peterson, who switched to all meat in 2015 and overcame her lifelong autoimmune disorders, brain fog, depression, anxiety, and fatigue by cutting everything out of her diet except beef. Shawn Baker, a doctor (who had his medical license revoked) and athlete, is also an outspoken proponent. Meat does offer an array of nutrients like B vitamins, vitamin A, iron, amino acids, fatty acids, zinc, and some minerals (especially shellfish, which is high in iodine). At this point, all we have are anecdotal evidence reports from people, both positive and negative, because we haven’t studied nor have long term data about an all meat diet. That doesn’t mean it is without benefit, but it’s instructive to know that you are a guinea pig in this particular diet experiment should you choose to make it a long term lifestyle. One reason this diet may offer such relief to those with chronic health issues is that it excludes foods that trigger inflammation or adverse reactions in people with autoimmune issues, chronic pain, and/or inflammation. The foods most likely to trigger reactions include dairy, nuts, legumes, grains, eggs, and even certain vegetables. It’s basically an extreme elimination diet. Believe it or not, plants contain phytochemicals that act as natural pesticides to dissuade consumption by predators (see The Plant Paradox and my blog post on lectins). These “anti-nutrients” are designed to poison or kill predators so the plant can remain alive. In most humans, these phytochemicals act as hormetic stressors that make us stronger, healthier, and more robust. That means they will irritate us enough to induce a compensatory adaptive response that results in many health benefits. Exercise is another form of hormesis. In other words, both exercise and brightly colored fruits and vegetables stress the body in a way that produces a response that is beneficial to health. Some of the most common problematic vegetables are nightshades, which are high in lectins. One theory about why the carnivore diet offers people with autoimmune disease or chronic pain so much relief is because lectins and anti-nutrients in certain vegetables may aggravate their autoimmune conditions and contribute to flares. Certain bodies, therefore, may react adversely to plant foods rather than reaping the hormetic benefits. That’s probably the reason that people with autoimmune diseases chronic GI conditions see a lot of relief and inflammation reduction eating only meat, at least initially. Another main argument I see in favor of an all meat diet is that many tribes throughout history thrived eating only meat, fat, and blood. First off, we don’t know 100% if there have been any purely carnivorous cultures. (source) And secondly, if your close ancestors weren’t carnivores, you might not have the genetic adaptations necessary to thrive on an all-meat diet. We fare best eating according to our ethnicity, and it’s a bit myopic to assume that just because ancient tribes on different continents than you that eat meat and fat (and hunt and move throughout the day and weren’t exposed to modern pollution or chemicals) had lower disease markers that modern humans or all ethnicities will also. So if you are not an Eskimo or from Mongolia or East Africa (where many of these tribes exist or may have existed), you probably don’t or may not have the genetic makeup that supports this type of diet. The all-meat diet is zero carb if done without dairy products, still minimal carb if you do include dairy. You might be thinking that because it’s so low carb, it must throw you into ketosis, and you’ll reap the benefits of a ketogenic diet (which vary per individual). But the carnivore diet includes too much protein to be a ketogenic diet. When the body takes in more protein than it needs, the excess is disposed of through the liver and also by a process known as gluconeogenesis, where protein is converted by the body into glucose. The process of gluconeogenesis is what prevents carnivore people from reaping the benefits of ketosis. Here’s the deal: the diet that is beneficial to you mostly comes down to genetics. It’s why some people thrive on high fat diets, whereas others may experience a spike in inflammation, putting them at risk for heart disease, if they eat keto or high fat. We’re not all adapted to eat a ton of fat or even a lot of meat. So there’s a genetic component to who may thrive on a carnivore diet. Fortunately you can map your genome to find out if your genes like a lot of protein or not. Aside from that, the main concern with a long term carnivore diet (longer than 2-3 months) is the lack of fiber that provides food and nourishment to the trillions of bacteria in our large intestine. These bacteria help us digest food, prevent disease, modulate inflammation, and manufacture certain vitamins. A fiberless diet wreaks havoc on the ecosystem in our colons (our microbiome). “Growing evidence suggests that in the absence of adequate fiber, the bacteria in the colon consume and thin the protective mucus lining, which then leads to impaired immune function and inflammation.” (source) A thriving, diverse and balanced microbiome is just not presence in the absence of dietary fiber. You can’t properly feed your microbiome with meat, because plant foods contribute to the robust probiotic environment that keeps you healthy. The majority of your immune system is in your gut, so it’s vital to make sure those populations thrive. Starving them = lower probiotic diversity, which could cause inflammation, leaky gut, and lowered immune response down the line. The one mild counterpoint to this is that meat does contain a shitload of amino acids that your gut lining needs to repair itself. 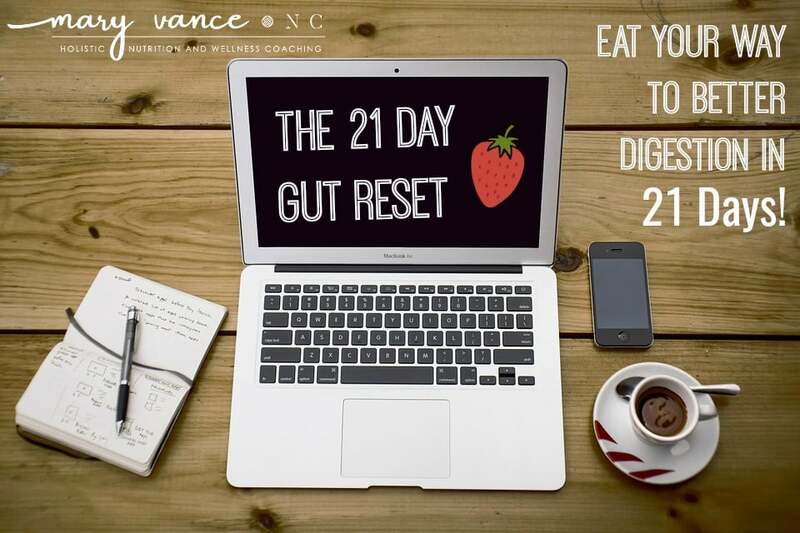 You can–and absolutely should–purchase a gut test that assesses your bacterial diversity if you intend on doing carnivore longer than a couple months. Try Viome or Biohm. Another major concern is that an all meat diet may turn on cancer pathways in the body (again, in some people) by increasing levels of a hormone known as insulin like growth factor one, or IGF-1. (source) One of the world’s leading researchers on longevity has found that “protein restriction has been associated with reduced cancer, diabetes, and overall mortality. Thus, interventions aimed at lowering the intake of proteins or specific amino acids can be beneficial…” (source) Also, a diet high in meat amino acids tryptophan, cysteine, and methionine in particular is shown to increase aging and cancer risk. For what it’s worth, studies on populations who live longest (those in the Blue Zones) share a major theme: They all have plant-based and diverse diets (that doesn’t mean they don’t eat meat; they just don’t eat a lot of it, or tend towards seafood). So there is a benefit for most people to eating a lot of plants. Moving along: There are just some nutrients you cannot obtain from meat. Folate, certain minerals, and vitamins C and E, for example, pretty much only come from veggies. You’re also missing out on certain vitamin co-factors that are necessary for other nutrients to do their jobs in your body. Anyway, you’re setting yourself up for deficiencies, and worst of all, robbing yourself of critical antioxidants you need to prevent disease. Finally, a main concern about eating all that meat and fat is cardiovascular disease (CVD). While we do know that meat and fat don’t cause heart disease outright, high levels of saturated fat absolutely can cause inflammation (which raises cholesterol) in certain individuals who don’t process large amounts of fat well (again, you can find out of this is you via genetic testing, or monitor your blood work regularly). Remember, one man’s superfood is another man’s poison. Many times, in an all meat diet, blood cholesterol levels rise quickly. High cholesterol may not cause heart disease directly, but it DOES indicate inflammation, which causes CVD. While CVD risks don’t rise in a matter of months, it’s a concern long term. Oh, and an all meat diet causes constipation in many people. You can probably guess why. IMPORTANT TO NOTE: If you try this diet, you MUST use grass fed or organic meats and wild seafood. Conventionally raised grain fed beef contains antibiotics and hormones and an altered fatty acid composition that contributes to inflammation. In certain people, beef may be a food allergen which would cause inflammation, organic or not. That’s not as common as egg or shellfish allergies, however. 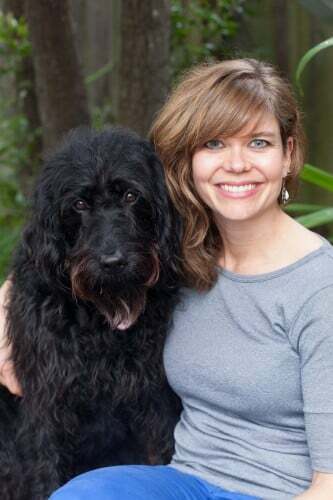 I rarely recommend extreme diets due to the potential risks involved and problems with compliance, but I have recommended an all-meat diet to certain clients with GI disease (especially chronic diarrhea associated with SIBO) or to those with autoimmune disease who experience regular flares or can’t find a way to decrease antibodies. I’d recommend the carnivore diet for 2-3 months until the person experiences remission, then we can start adding back in some of the milder (nightshade free) veggies to identify triggers. This process must be done slowly and deliberately so you can tell which foods or classes of foods cause symptom flares, AND you should work on healing your gut simultaneously. If you’re doing strict carnivore because you’re experiencing adverse reactions to even very small amounts of plant foods, that’s likely a sign of an underlying gut infection that should be addressed. 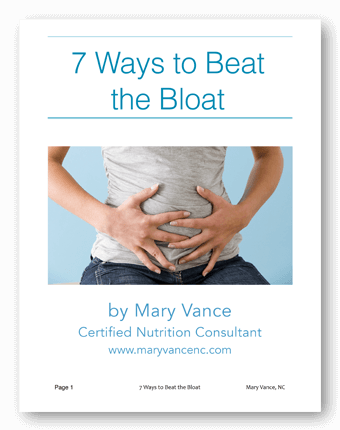 Once your gut health improves, you should be able to tolerate more plant foods over time. See my post on the elimination diet for food reintroduction directions. This diet may work well for metabolic syndrome, but I’d recommend keto over carnivore for that. Also note that the transition period can be very unpleasant (similar to the keto flu), lasting 7-10 days, and if it does trigger brain fog, malaise, or flu-like symptoms, you need to add sea salt to your water for additional electrolytes. If you’ve done genetic testing and know you don’t do well with high protein or high fat diets, this isn’t the diet for you. That said, it probably won’t hurt to do it for a couple months. If you have adrenal fatigue or hypothyroidism, use caution. I have, however, seen antibodies associated with Hashimoto’s autoimmune thyroiditis decrease on a 2-month carnivore plan. If you have high iron, ferritin or kidney or liver disease, avoid. My major concern with this diet is the extreme restriction and potential damage to your microbiome. We don’t have long term data about all meat diets. And some, maybe even most, of us aren’t a genetic fit for this diet, meaning it can raise your disease risk. Any diet that supports eating only one thing– even only plants!– can be problematic because you’re just not getting the array of nutrients you need to thrive. It’s fairly astounding the number of nutrients your body needs to keep you healthy. That said, I think it can be very therapeutic to those fighting SIBO, Crohn’s, or autoimmune diseases when used for a period of months. If you do try this diet longer term, make sure to monitor your blood work and gut function (via stool testing for bacterial diversity) every few months, or make it a temporary (3 months max) experiment. Have you tried an all meat diet? What was your experience? Please share. 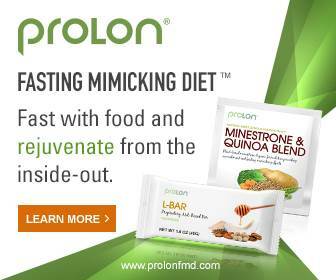 Rethinking the Candida Diet Fasting Benefits Without Fasting: My 5 Days on the Fasting Mimicking Diet What is the Best Diet for SIBO? Should You Avoid Lectins for Better Health? (Plus: How to Determine if Lectins are Harming You) Is Sugar Killing Us? My Answer May Surprise You.